During this event, new costume employees with Halloween clothing appear! 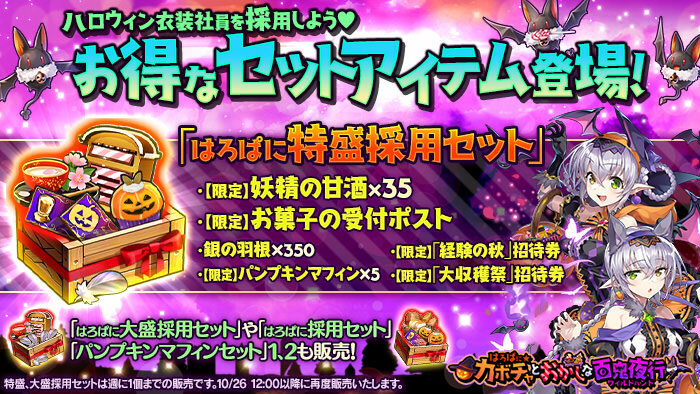 ▼ ★4★3 Halloween Costume Employee present! Log in during the event to receive a [Limited] ★4★3 Autumn Evening Envelope (4x) x1 as a present! The [Limited] ★4★3 Autumn Evening Envelope (3 letters) is a special envelope that contains resumes from the costume employees [Viviane], [Recca], [Ainnor], and [Melnor], and you can pick one of them! ▼ Collect pies to help the girls out! During this event, use the pumpkin pies you help guide the six girls through a safe course in the wild hunt. 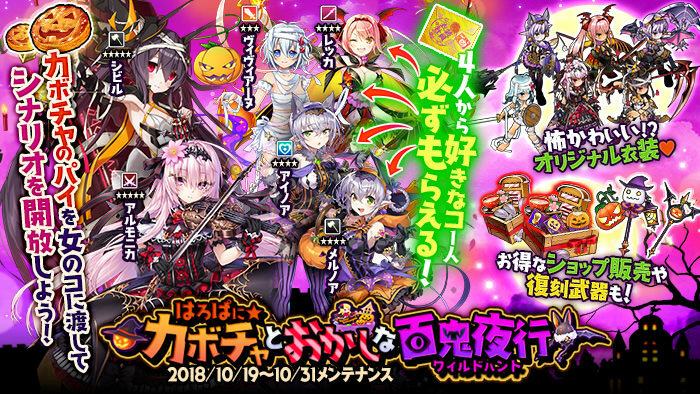 The Event Quests will drop [Pumpkin Pies] which can be collected to help these girls. Visit the special event page to deliver these pies to the girls. After receiving a certain amount, you may receive an item gift from the girl in return. Unlocking and reading through each girl's scenario will increase the pumpkin pie and EXP you gain from the event quests! Sibylle ⇒ Recca ⇒ Viviane ⇒ Ainnor ⇒ Melnor ⇒ Armonica. After helping Armonica and finishing her scenario, the epilogue scenario will unlock. An Event Quest where you can collect [Pumpkin Pies], EXP, etc. Use the [Urgent] [Great Harvest Festival] Invitation Ticket to unlock the quest for 30 minutes. Drops a large amount of [Pumpkin Pies]. [Limited] Bread Packs can also appear as a rare drop. Use the [Urgent] [Autumn Experience] Invitation Ticket to unlock the quest for 30 minutes. [Limited] Licking Candy can also appear as a rare drop. Use the [Ball Invitation Ticket 1] to unlock this limited time quest. Drops the event accessory [Banshee's Mask]. Use the [Ball Invitation Ticket 2] to unlock this limited time quest. Drops the event accessory [Banshee's Mantle]. Even recipes can be obtained from the gifts you receive from the girls. 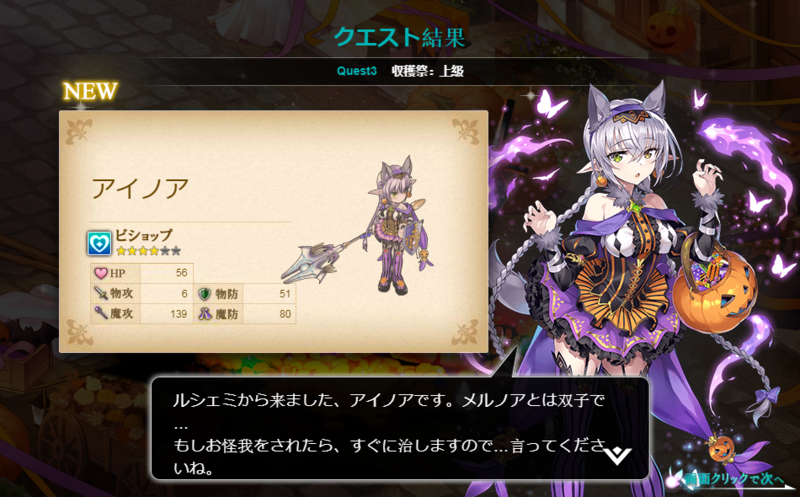 Equipping the event weapon will give employees a new in-battle graphic where they are in Halloween attire. ▼ Collect Pumpkin Pies more easily with Event Equipment! 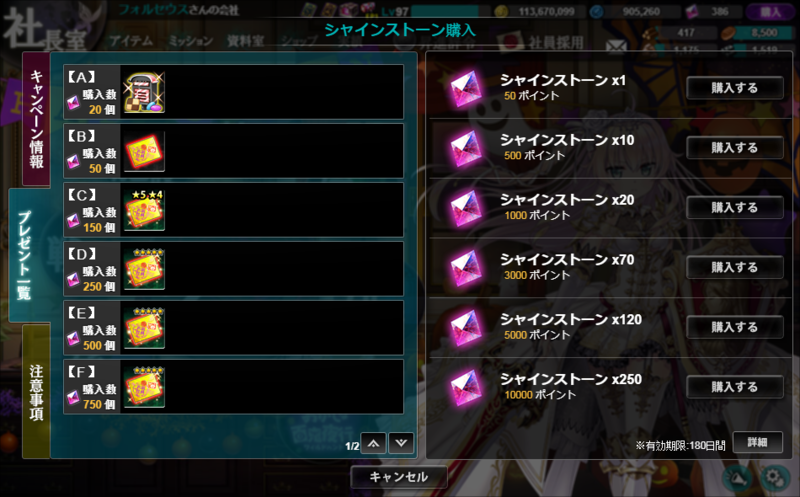 The limited time event recipes you receive as gifts from the girls can be used to craft +4 equipment. Using this +4 equipment in the event quest will lead you to a route where you can collect more Pumpkin Pies. Having more employees in your party with +4 weapons equipped will lead to even more pumpkins. ※ Only affects the event quest [Harvest Festival] Beginner Rank to Ultra Rank. Does not affect [Urgent Quests]. 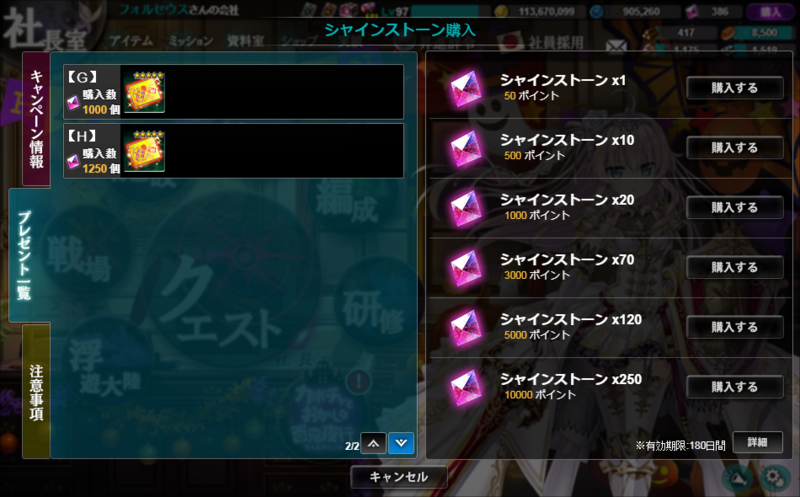 ※ This effect also applies to any +4 [Kanpani☆HALLOWEEN2015] equipment. These Urgent Quests can help you collect large amounts of [Limited] Pumpkin Pies or large amounts of EXP. During this event, you will receive an invitation ticket every day to the [Banshee's Ball: Mask] or [Banshee's Ball: Mantle]. [Banshee's Ball: Mask] will drop the event accessory [Banshee's Mask]. [Banshee's Ball: Mantle] will drop the event accessory [Banshee's Mantle]. The [Invitation Tickets] will be distributed to your in-game mail at set times, and last for 15 minutes when used. ※ These invitation tickets have [24 Hour] on them and will expire in one day. 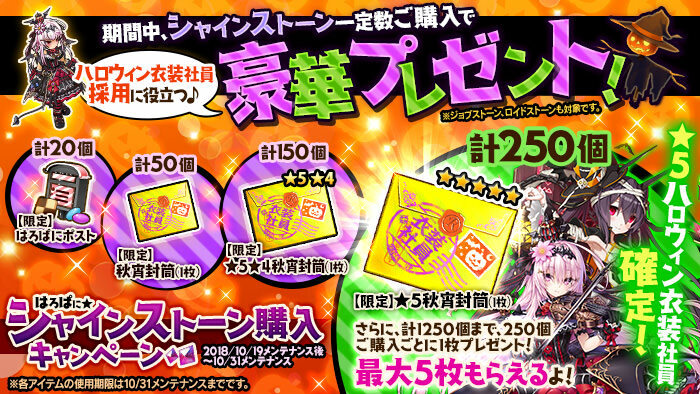 They have the same content as a [Limited] version of the invitation ticket. ※ 10/31 (Wed) does not have a ticket. Recovers 1000 Bread when used. Unlocks the [Autumn Experience] Quest for 30 minutes when used, which provides items useful for raising employees. Expires 24 hours after the distribution time. Please check the distribution times for more details. Unlocks the [Great Harvest Festival] Quest for 30 minutes when used, where you can collect large amounts of Pumpkins. Expires 24 hours after the distribution time. Please check the distribution times for more details. This event will conclude with the 10/31 (Wed) maintenance. [Limited] items will expire with the 10/31 (Wed) maintenance. The special event page item [Limited] Pumpkin Pie and certain event items will no longer be available after the maintenance. Last edited by Folseus; 10-22-2018 at 03:14 AM. After trying, actually is not bad. The previous event the hearts were rare drop. This event the pumpkin pies are event item common drop and can be boost with +4 Halloween weapon. Last edited by Mikan; 10-19-2018 at 11:38 AM. ANy tips for using those tickets? UGH another costume limited girls again......kinda hate how this game recently pulling limited charas BS. At this rate I dare to bet x'mas and new year will have another set and batches of limited costume employees too....bah. @D Des It's been confirmed by the people in the JP forum. It seems all the new Halloween character (including 5-stars) can drop from the main event quest ultra difficulty. But you got to enter the extra round for a chance character drop. 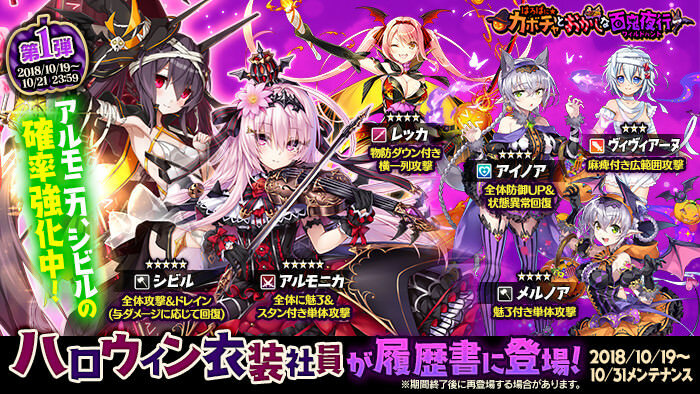 You can boost that extra round to appear by equipping +4 Halloween weapons (both new and old 2015 version are fine). (is this ultra? because thats as high i can go) bread for a single run when my pool is only 6.7k lmao.